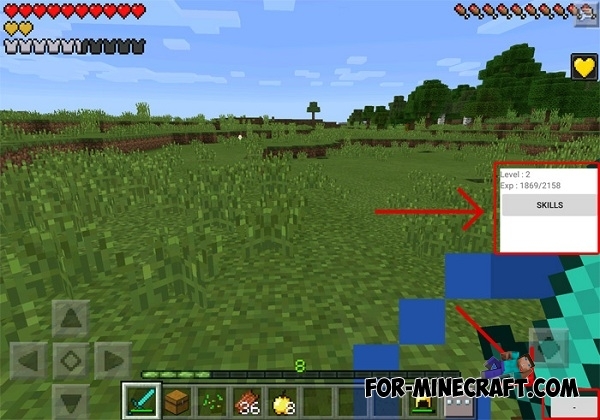 Skills mod adds new experience points in Minecraft Pocket Edition. After you get enough experience, you can use these points to get various skills. Having a certain skill, you will get a certain effect associated with this skill. Once you spawn into the world, part of the interface will be changed. On the right side of the screen will be located a small GUI that displays the experience statistics, as well as a button for updating your skills. In the lower right corner of the screen you will see a button, which is necessary to enable or disable of this GUI. Each skill can be improveda a few times. That's why we have decided to use «X» for the duration / amount of damage / healing time as a value for each skill, because these values are change with each improvement.